This is gardening at its best. What a silence can come over you when wandering in a beautiful garden. The smell of blooming flowers, the different shades of green reflecting in the ponds. What is it that is so very calming for our minds? We take it in as pure energy straight to the core. One famous beautiful garden lies halfway between Paris and Le Havre. This was once the domain of Claude Monet, an impressionist painter who captured the reflecting light on canvas brilliantly. Close to Giverny you will find in the department “Normandy”, the roots of the french cheese Camembert and once you are there, go at the next farm and buy a bottle of Calvados. One morning at ten I was offered a long drink glass with young Calvados. It hit me like a rock! Better go for the mature version, or take a Pommeau, a mix of Calvados and applecidre, very soft and velvetlike. At the side of the road you will pick some herbs, like rosemary and thyme. Combining Monet, a garden and some paint gave us astonishing paintings. 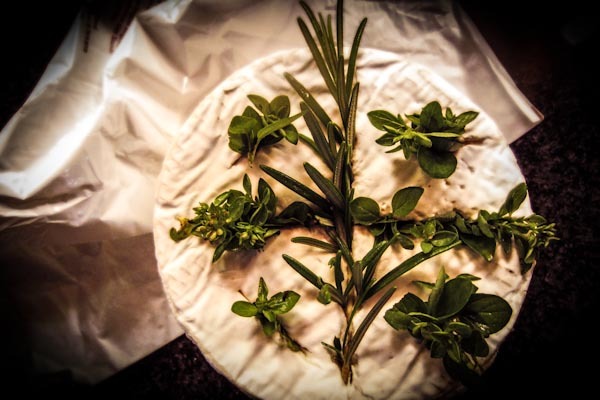 When combining Camembert some herbs and Calvados magic is at work! You create your own little herbgarden, but you have to water it, …..with Calvados. Turn your oven at 200 Celsius / 400 Fahrenheit, unwrap the Camembert and place it back in its wooden-box. With a knife make a cross-cut 2/3 deep, and some extra cuts. With the back of the knife push the herbs firmly in the cuts. Put the box in the warm oven for 21 minutes, drizzle an eggcup of Calvados on top in the last 7 minutes. In these pictures rosemary and oregano were used. Experiment with different herbs, give it a try with let’s say lavender and honey-balsamico drizzle. Oh man, I bet this is so good. I’ll definitely have to try this sometime. Looks heavenly. Hello Linda, thanks for your comment, and yes it is so easy and tasty. But I saw at your blog you can handle yourself. Wow quite impressive the attention you give the things around you, my compliments. Wow! Thanks for taking a look! I’m glad you’re enjoying what we’re trying to do. :] Happy readings! Nice recipe! 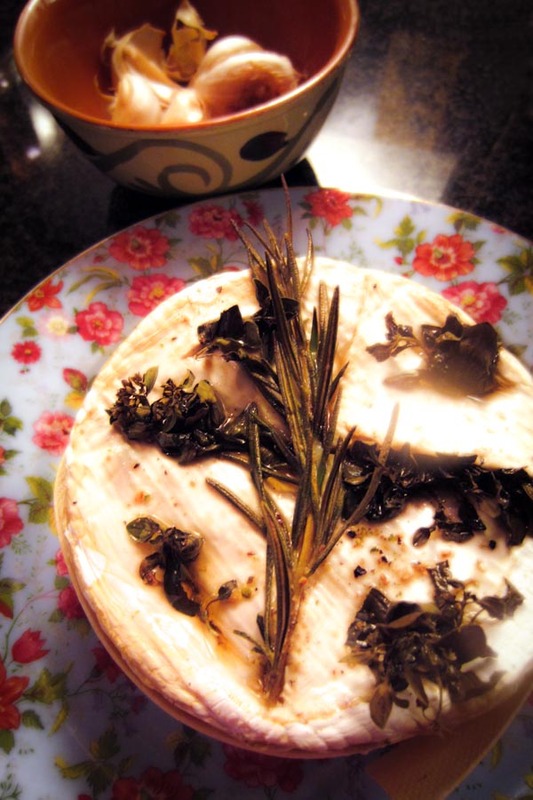 Big fan of Monet, can see his painting of Etrétat when I close my eyes and think of this delicious Camembert…. Nice one!